The cargo ship from Cyprus hit Ras Muhamed in 1980. The main body of the wreck is way below recreational diving (about 150 metres down). 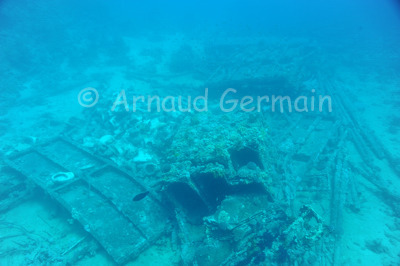 But the reef is littered with the cargo of the ship: Amongst the twisted pieces of metal are toilet seats and bath tubs. It is a bit strange to see them underwater. Nikon D700, Nikon 28-105 mm macro at 28mm, F8, 1/80th, ISO 400, Ikelite Housing and Ikelite DS160 strobe set on TTL. Yolanda Reef, Ras Muhamed, Egypt.